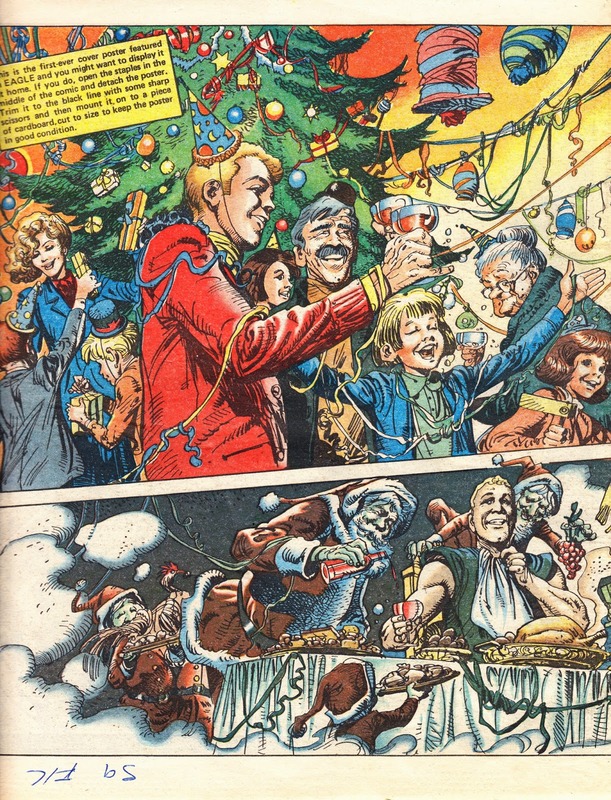 From December 1984: MAX's Thirteenth Floor gets festive in this EAGLE wraparound cover. From December 1983: Quite possibly THE most scary Christmas cover ever! 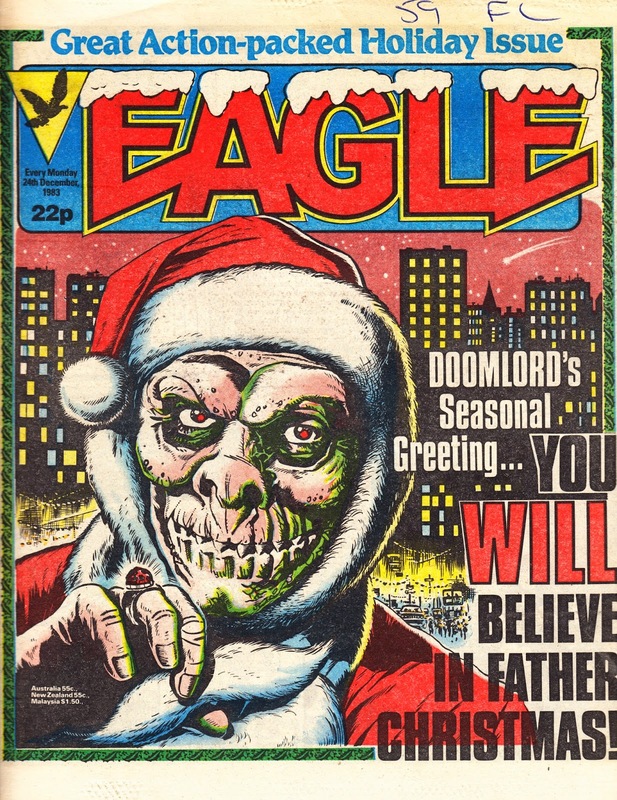 Doomlord spreads festive cheer (not!) 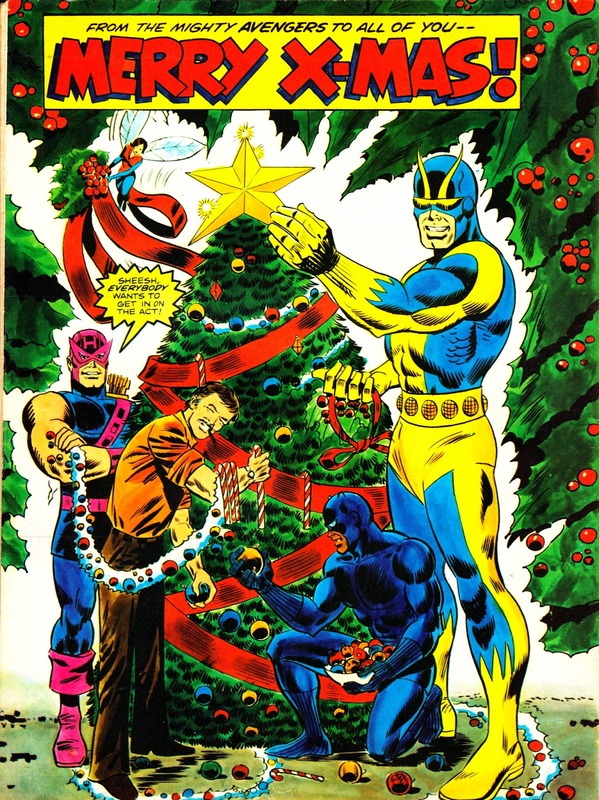 on the cover of the EAGLE's 1984 Christmas issue. 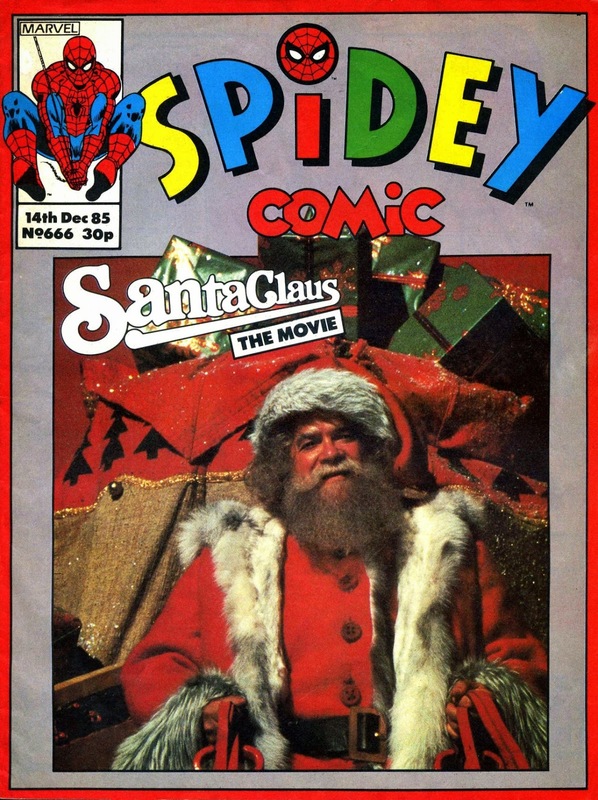 From December 1984: Another Spider-Year, another Spider-Christmas. MARVEL UK celebrates the festive season again with another exclusive Christmas cover. This is from SPIDER-MAN weekly (the "Amazing Friends" suffix was ditched once the value of the TV tie-in was lost) issue 615. 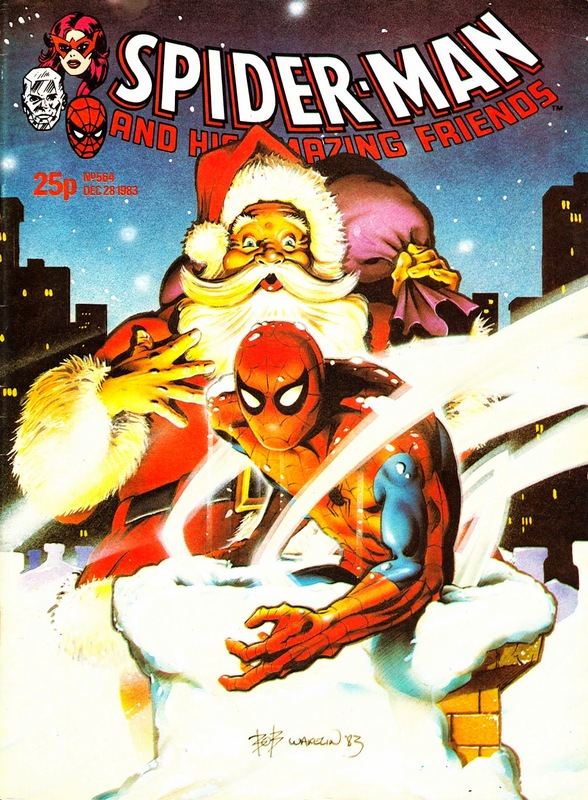 From 1983: More festive web-slinging from the Annex of Ideas! The specially-commissioned cover for MARVEL UK's SPIDER-MAN AND HIS AMAZING FRIENDS (the then-current incarnation of the long-running weekly) issue 564. 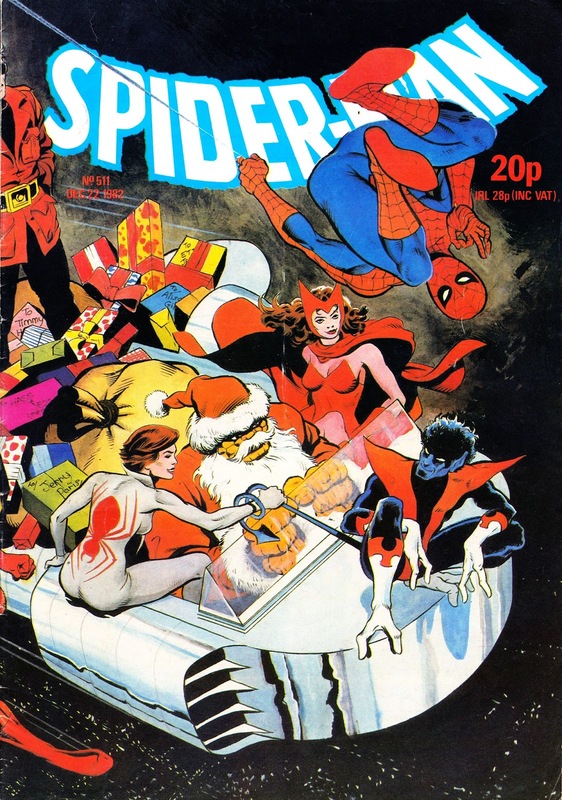 From December 1982: A cavalcade of Christmas heroes on this fantastic wraparound cover from MARVEL UK's SPIDER-MAN issue 511. From December 1994: The celebrations continue... Another THIRTEENTH TRIBE Christmas cover (issue 55) from the UK's BATTLESTAR GALACTICA Fan Club. 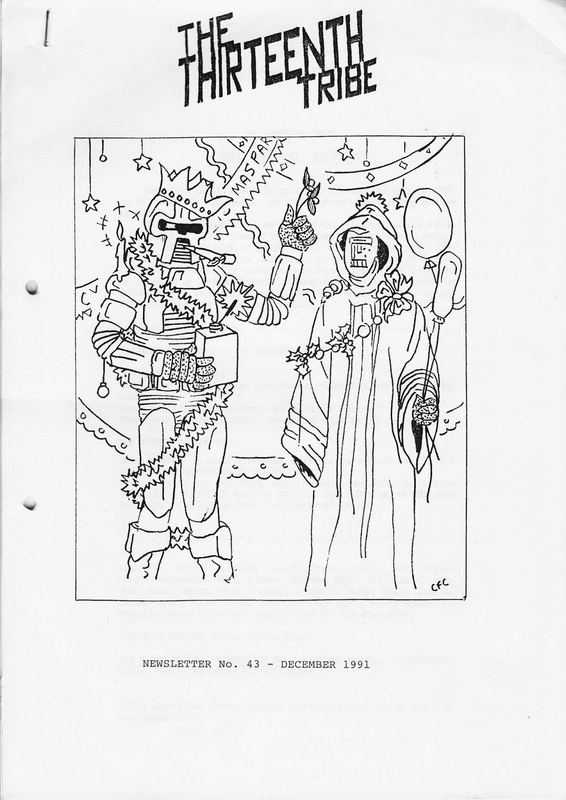 From December 1991: a Christmas cover for the 43rd issue of THE THIRTEENTH TRIBE newsletter, published by the UK's unofficial BATTLESTAR GALACTICA Fan Club. From December 1982: A blast-from-the-past as the revived EAGLE celebrated its first Christmas by pushing the boat out and calling in LWT's GAME FOR A LAUGH team for a festive photo-call. Note the strategically-placed copy of the first (of the new era) EAGLE ANNUAL. From December 1985: Christmas comes to the Beyonder's construct-a-planet SECRET WARS venue for this festive-themed cover to the UK weekly. 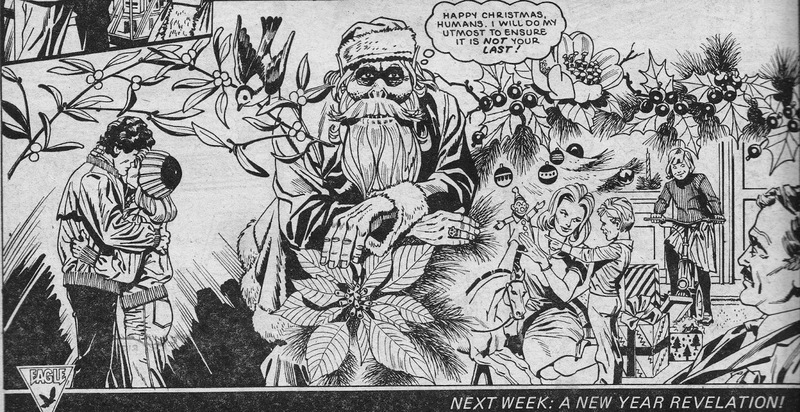 From December 1981: a UK-only Bryan Talbot festive-themed full colour piece from the back page of London Edition's THE SUPER HEROES (a UK black & white monthly dedicated to reprints of various DC strips of various vintages) volume 2, issue 3. Festive greetings from... guess who?!? 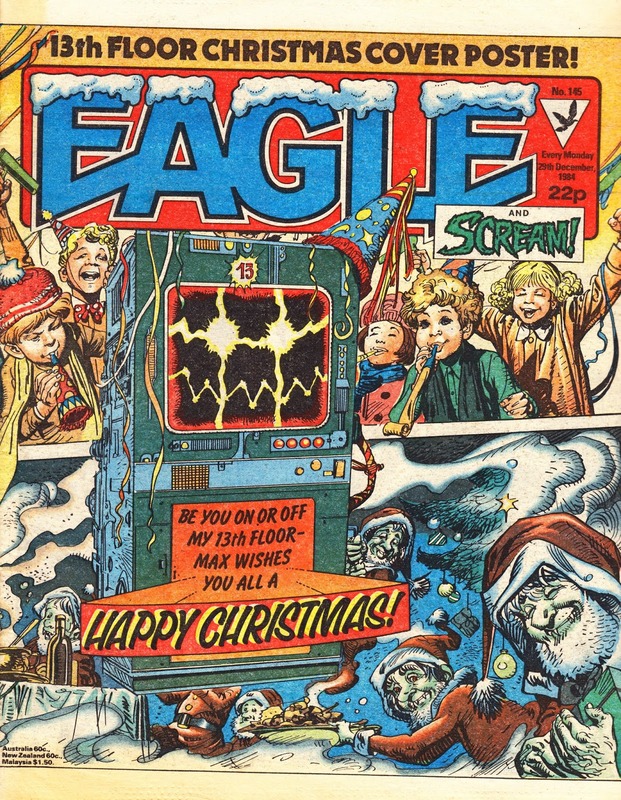 The final panel from the Christmas 1983 issue (cover-dated 24 December 1983) of the EAGLE. From February 1978 (and the very first issue of STAR WARS WEEKLY): Another full-page piece of art dedicated to the movie. 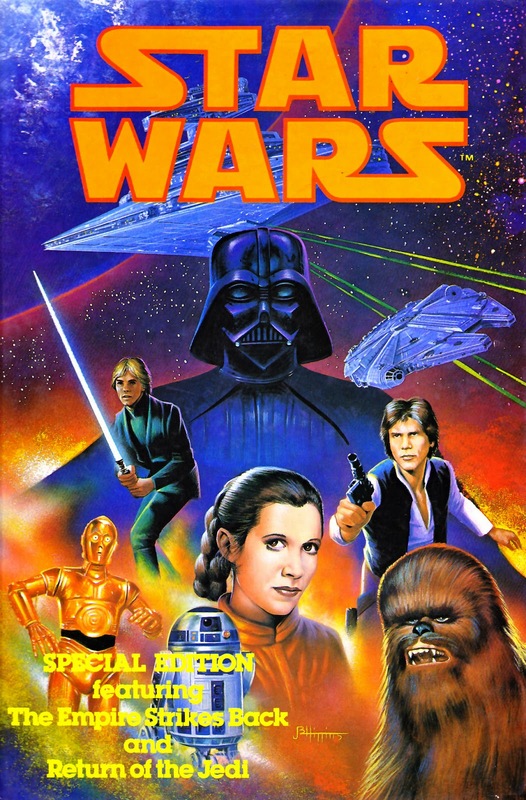 SWW was released so late (almost a year after the American edition... which of course was released before the movie itself was even completed, much less released) because the film took more than six months to cross the Atlantic. And even longer the secure a national release across the UK. The blockbuster was released in London on 27 December (but only on a few screens) and then took several weeks to build up a wide release. In those days, with the only outlet for TV advertising being ITV, it made perfect sense to release movies on a region-by-region basis and then shift the movie prints, and the TV advertising, to another part of the country. 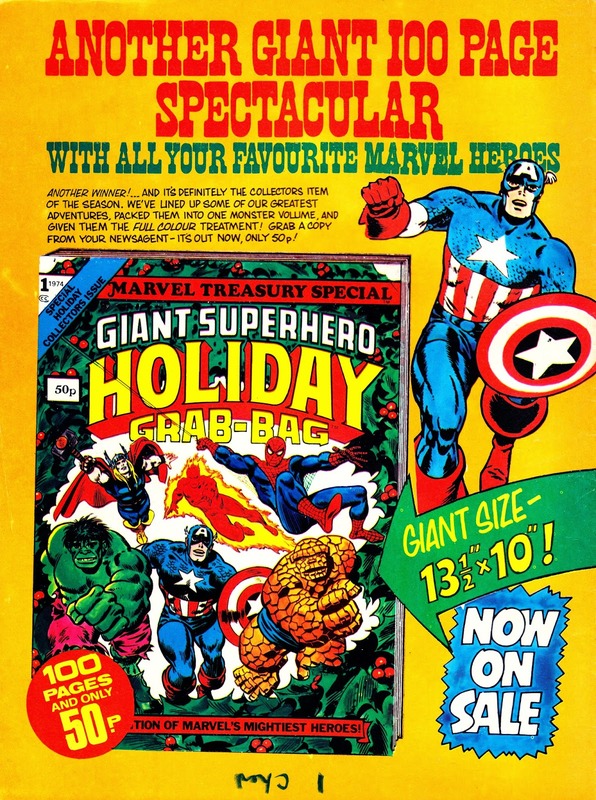 From late 1975: another, more traditionally dimensioned, MARVEL UK House Ad for the 1975 edition of the GIANT SUPERHERO HOLIDAY GRAB-BAG Treasury Edition. 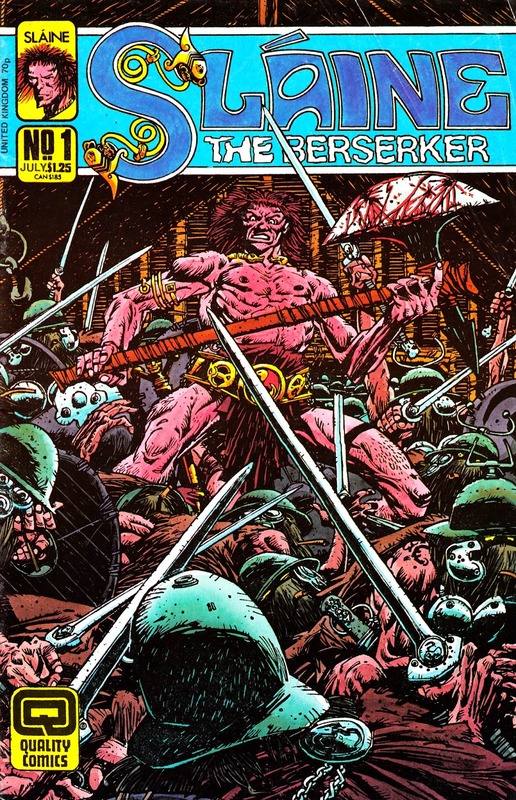 From July 1987: the first issue of QUALITY COMICS' ongoing SLAINE THE BERSERKER book, reprinting strips from 2000AD. This ultimately ran for 28 issues. The first twenty appeared under the original title, the final eight rebadged as SLAINE THE KING. The run ended in the summer of 1989. 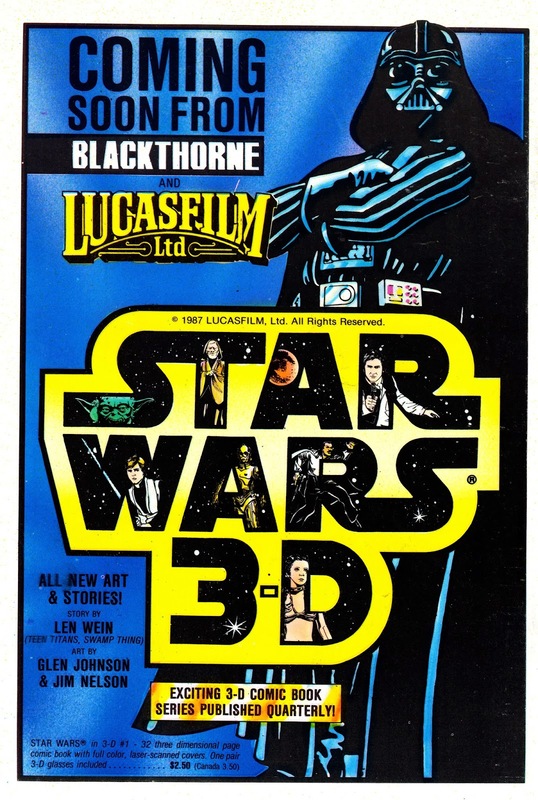 From 1987: an advert for the about-to-launch STAR WARS 3-D ongoing series (it managed three issues) from (masters of the third dimension... and How-to-draw books) Blackthorne. Although it was celebrating its tenth anniversary (and an anniversary is always a good hook to drum up some business), the saga was all-but-moribund in 1987 (although I think the special celebratory issue of STARLOG might have reminded a lot of people how much they liked it) and Lucasfilm were finding it hard to get anyone terribly excited. Marvel had bowed-out of the comics franchise the previous year (although the two animated spin-offs continued) so it fell to an indie to keep the flame burning. I had the first two of these (all three are now collected, along with a complete run of the Marvel UK SW strips, in a Dark Horse trade paperback... buy it now as it may go out-of-print now the license has returned to Marvel) at the time and I thought they were OK... although (despite the old-fangled visual technology) not really in the same league as the old Marvel stuff. 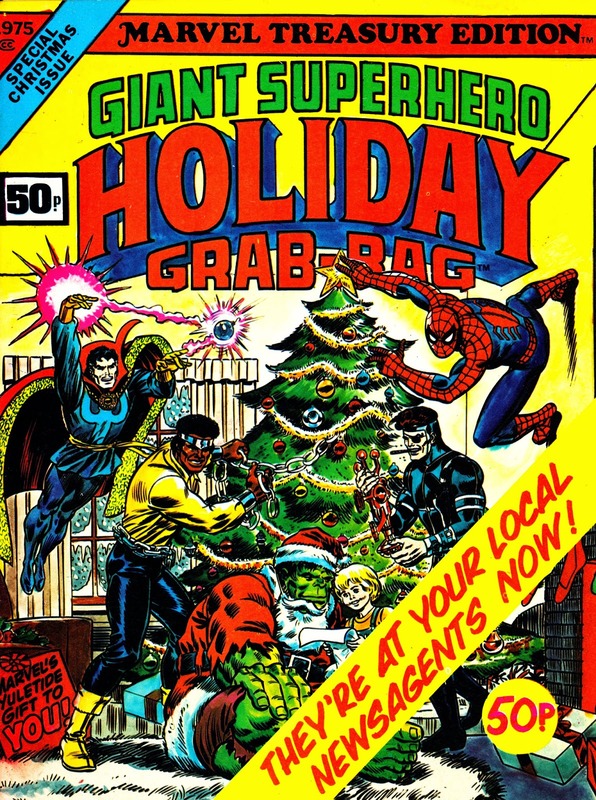 From late 1974: a MARVEL UK House Ad for that year's festive-themed GIANT SUPERHERO HOLIDAY GRAB-BAG, the latest imported installment in the ongoing run of Marvel Treasury Editions. 100 pages of tabloid goodness. From 1979: Another reel of BATTLESTAR GALACTICA bloopers. This is a poor multi-generation VHS copy of what appears to be the film (as per the tradition) shown at the end-of-season (it seems no-one, at least amongst the cast, had much of an inkling that they were also marking the end of the series itself) wrap party. This has been doing the rounds for a while, and duplicates some of the material from the other blooper reel (posted previously) but it's still worth a look. 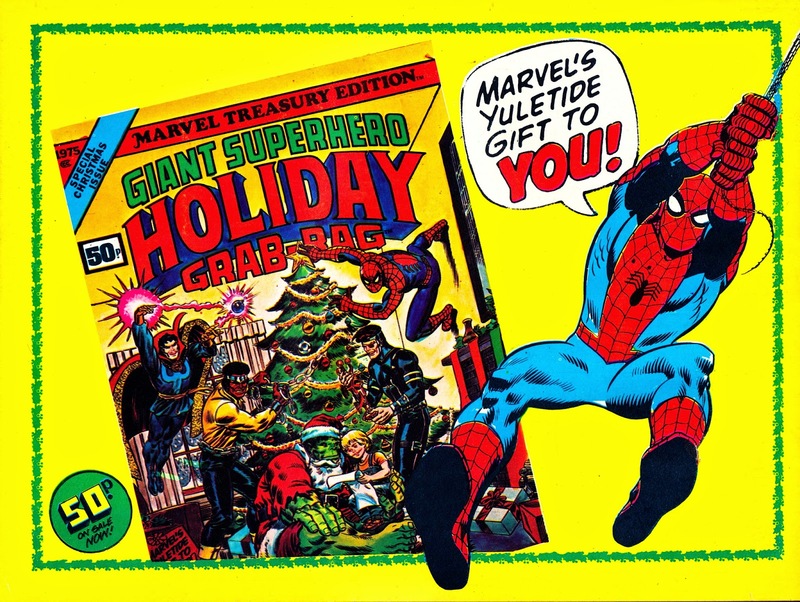 From December 1975: a landscape-format Marvel UK House Ad for imported cents-to-pence copies of the GIANT SUPERHERO HOLIDAY GRAB-BAG Treasury Edition. 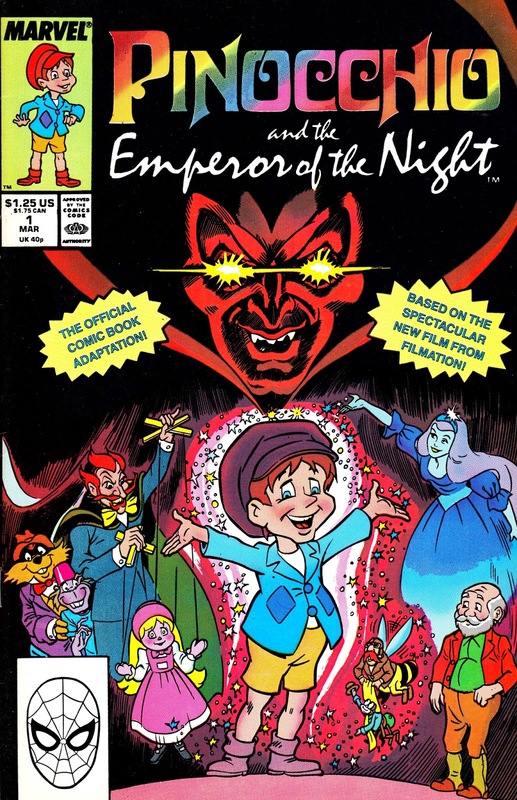 From Christmas 1987 (cover-dated March 1988), Marvel's adaptation of Filmation's PINOCCHIO AND THE EMPEROR OF THE NIGHT animated movie. Remakes (and sequels) of successful Disney movies based on public-domain fairy tales and stories are nothing new (and intentionally designed to trick dozy buyers and undemanding kids) but you'd expect better of the Filmation crew. I've not seen the movie but, knowing their usual production standards, it probably isn't a stunner. The Marvel tie-up was because the film was released by NEW WORLD PICTURES, Marvel's owners. 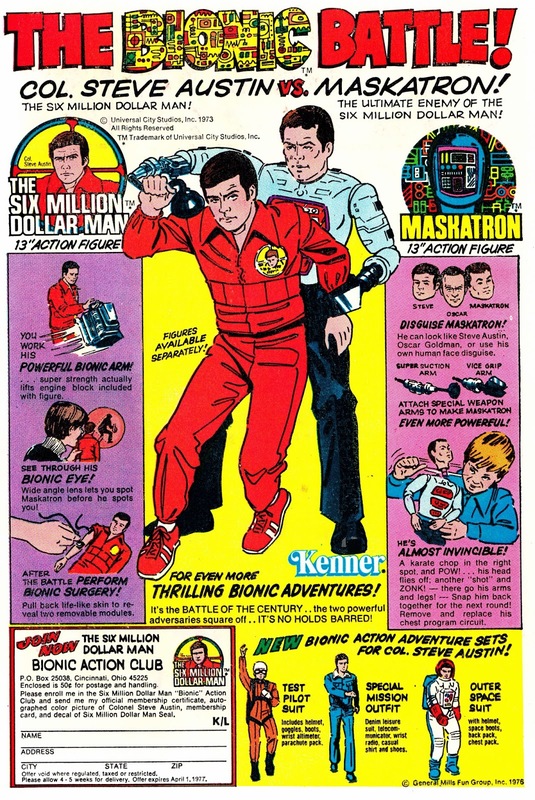 From late 1975 (and just in time for the Giftmas giving season): a US comic book advert for the range of SIX MILLION DOLLAR MAN toys from Kenner. It seemed to be obligitory to either have one of these red-suited cyborgs yourself... or have a friend that did. They were ubiquitous during the early years of the Star Age. 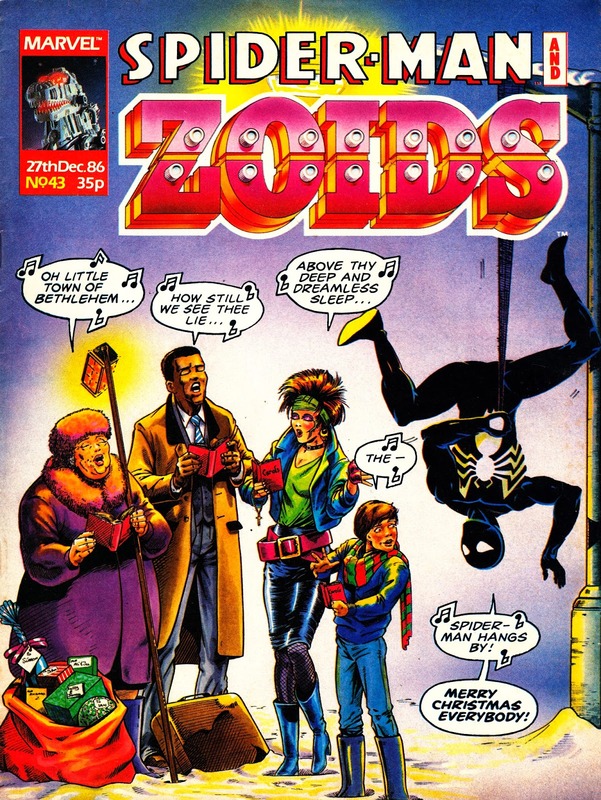 From December 1986: the one-and-only Christmas edition of the short-lived successor to the original SPIDER-MAN weekly: SPIDER-MAN AND ZOIDS. This reincarnation, after the disastrous reboots of the previous year, was a much-needed return-to-form and a new attempt to appeal to an older readership. 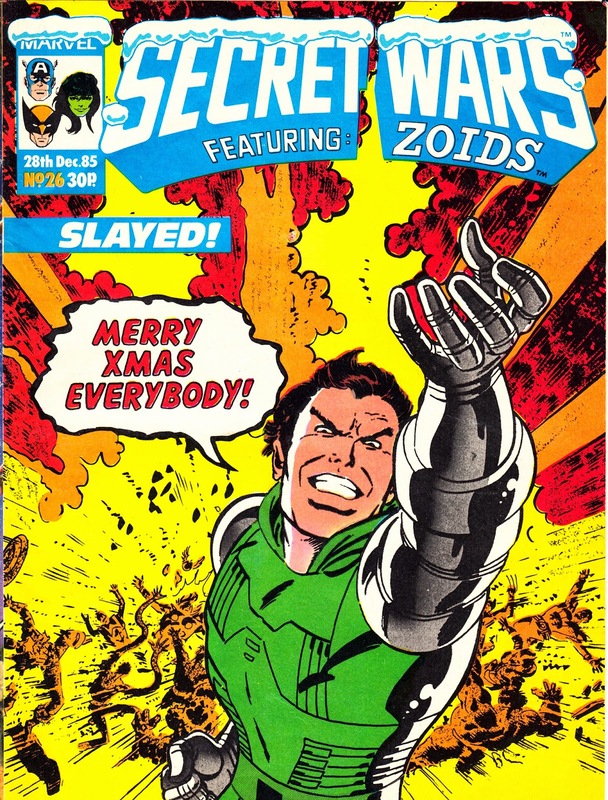 Presumably, SECRET WARS was deemed well-enough established to be able to cope with the competition... or the Annex of Ideas knew that its finite lifespan was coming to an end and launched SM&Z as a would-be replacement (in the end, it only outlasted SWII by a few months). It's easy to dismiss the Zoids strip as an unwelcome toy brand, representative of the state of the British comics business in the 1980s. All that is true. But it was also a stonking good epic in its own right (insert obligatory Grant Morrison reference here) which borrowed liberally from films that the target audience were (in theory) too young to see. Indeed, the weekly collapsed (after only 51 issues... with must have made the birthday celebrations bittersweet) because, briefly, it looked like the Zoids were destined for bigger and better things and the consensus was that readers wouldn't stick around for a solo Spidey title, no matter how good the other back-up strips were. 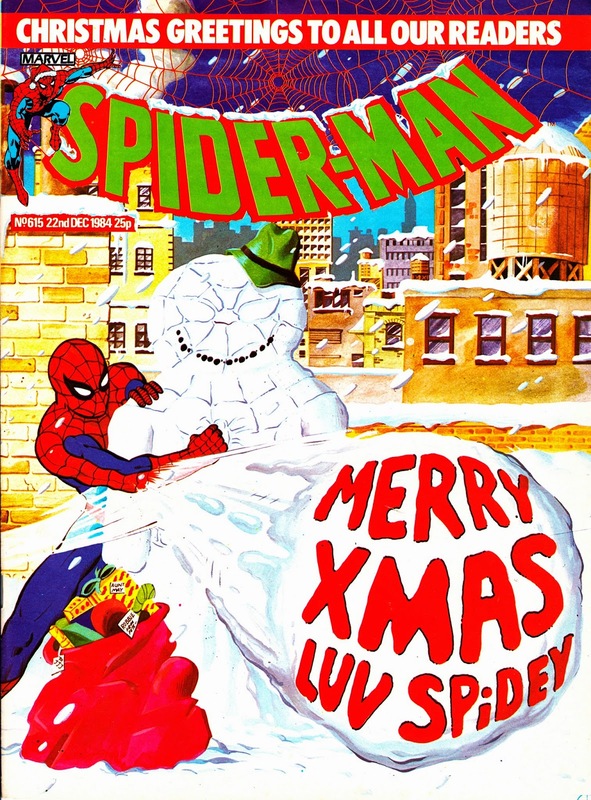 It had been a long fall from 1980 when M-UK had churned-out TWO Spider-man weeklies (the original and MARVEL TEAM-UP), a monthly (SPIDER-MAN POCKET BOOK) and the usual seasonal annuals and specials. 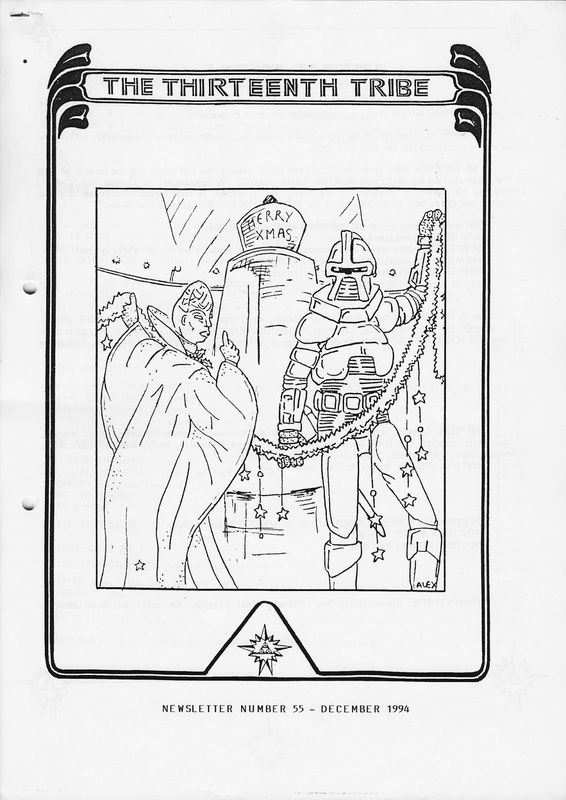 From 1984 (probably): The STAR WARS ANNUAL was a British Christmas tradition for a generation of Star Warriors during the Star Age... but this is a permeation that you may be less familiar with. Grandreams (MARVEL UK's early-eighties partner-in-crime for Christmas hardbacks) put together this special double-length compilation of Marvel's THE EMPIRE STRIKES BACK and RETURN OF THE JEDI movie adaptations as a store-exclusive sold through BHS (formally British Home Stores). The ESB strip is a rerun of the "wrong Yoda' version with a purple off-model version of the venerable Jedi master based on some pre-production art. 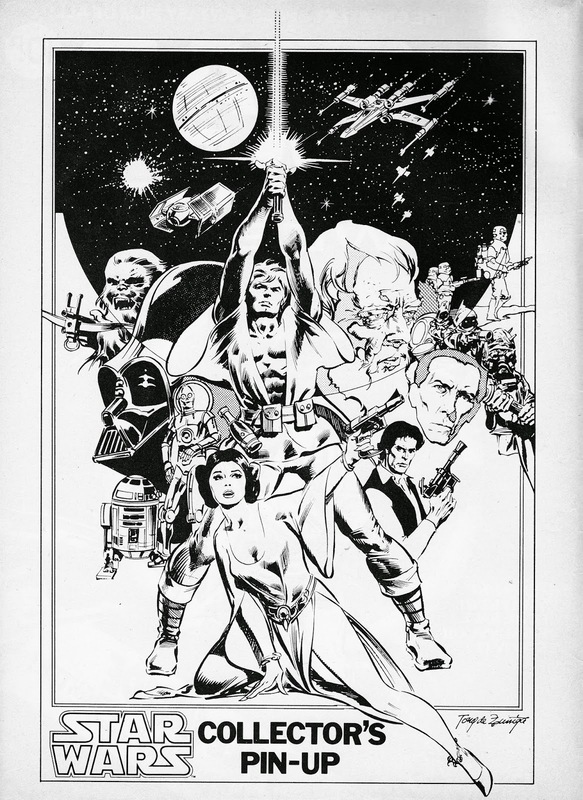 From 1978: Another (slightly bizarre) STAR WARS WEEKLY pin-up page, this time from the back-cover... allowing the Bullpen to add a (very) little colour. From (early) December 1985: the 666th (appropriately) and final issue of MARVEL UK's long-running (since 1973) SPIDER-MAN COMIC, languishing in its last incarnation as the kid-friendly SPIDEY COMIC. An inauspicious end for a bastion of the British comics scene. The ol' Web-slinger is even relegated to the corner box of his own last issue. Oh the indignity. For many readers, the last issue of the venerable long-runner was probably issue 634 from some seven months previous. That (somewhat slung-together) issue was the last to pitch itself at the traditional Spider-crowd. From the following week, it became THE SPIDER-MAN COMIC with a new remit to appeal to younger readers rather than split the audience for the just-launched MARVEL SUPERHEROES SECRET WARS fortnightly. This final name-change kicked-in from issue 651. At the end of the run, Spidey Comic was publishing a (non-Marvel) adaptation of the Disney movie THE BLACK CAULDRON, SPIDEY SUPER STORIES ("The Vanisher Shows Up) and THE EWOKS (based on the yet-to-be-seen-in-the-UK animated series). The festive cover (probably a little premature as this would have been on sale during the second week of December) was justified by a two-page article pegged to the impending release of the Dudley Moore vehicle SANTA CLAUS: THE MOVIE. The one ray of light amongst the dross was the announcement that Spider-man would return "in a few weeks" (more like three months) in a new weekly that would also feature the Fantastic Four (they had to wait a few weeks into the run to make their premiere). No mention of the Zoids. From 1979: a nice collection of bloopers and outtakes from BATTLESTAR GALACTICA. For some reason (rights? ), this is AWOL from both the DVD and BR editions of the series... which is a real shame. 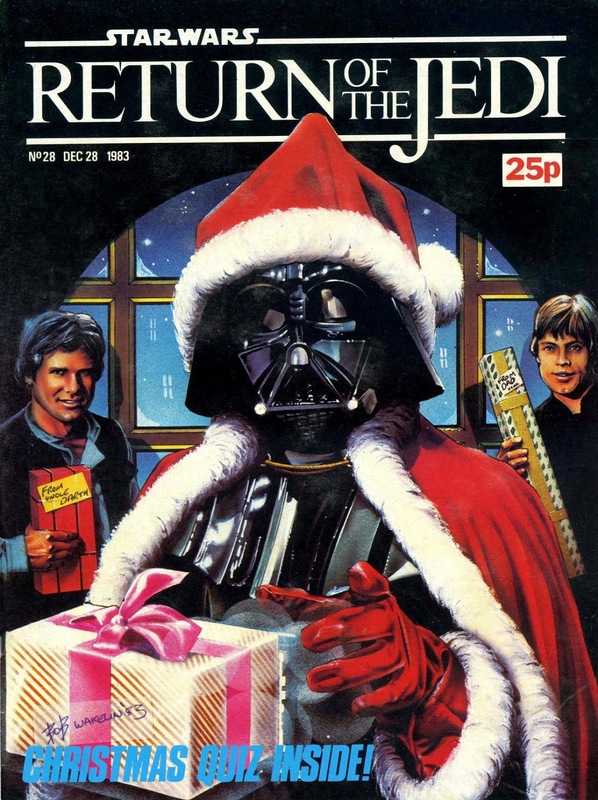 From Christmas 1983: the festive front cover for MARVEL UK's RETURN OF THE JEDI issue 28. This is the last week of STARLOGGED posts before Slow Robot takes his annual Christmas vacation so, throughout the week, I'll pepper in some festive fare alongside the usual wherever-the-mood-take-me stuff from the Starlogged vaults. 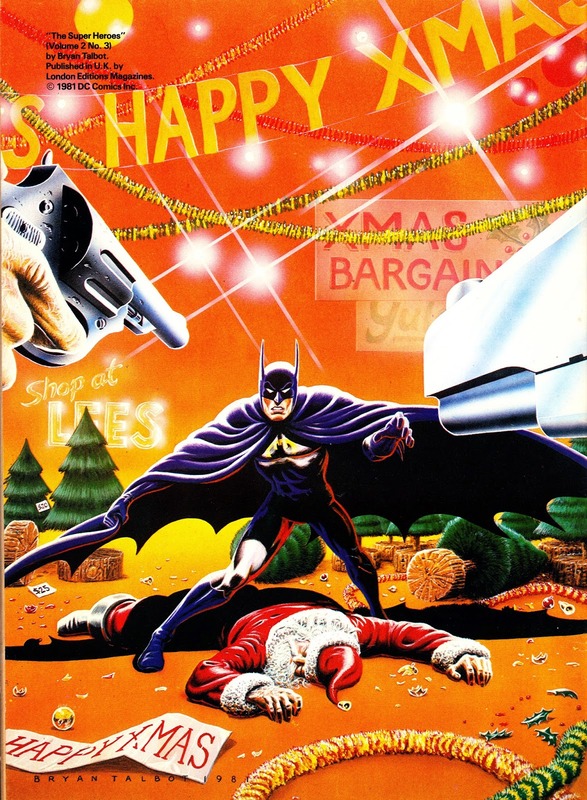 This Bob Wakelin cover, worthy of an official Lucasfilm Christmas Card commission, was (as far as I can recall) the only time that M-UK ever did an overtly Christmas-themed cover on their SW comics. CYRIL popped-up, in a Santa hat, on the front of the following year's Xmas week issue (issue 80) and it shuttered in the summer of 1986. In commendable attention to detail... look closely at the reflection in Darth's 'eye'. 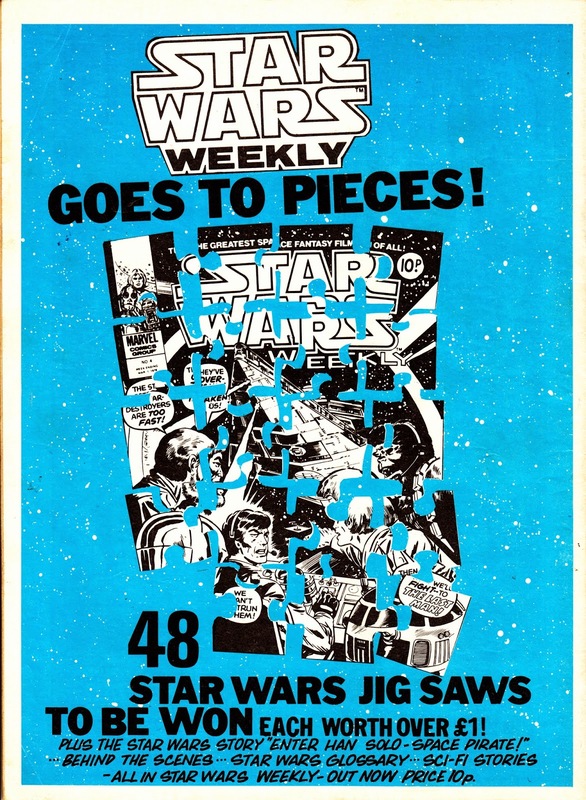 From early 1978: STAR WARS WEEKLY goes surreal in this Marvel UK House Ad for its fourth issue. From late 1992: the first issue of MARVEL UK's DOCTOR WHO CLASSIC COMICS, a surprising show of faith in a defunct TV show (placed on an unofficial hiatus in 1989 to avoid fans sending the TV Centre switchboard into meltdown) but also a reflection of the success of the regular Marvel magazine (a steady seller which shifted roughly the same number of copies each issue, regardless of the contents). 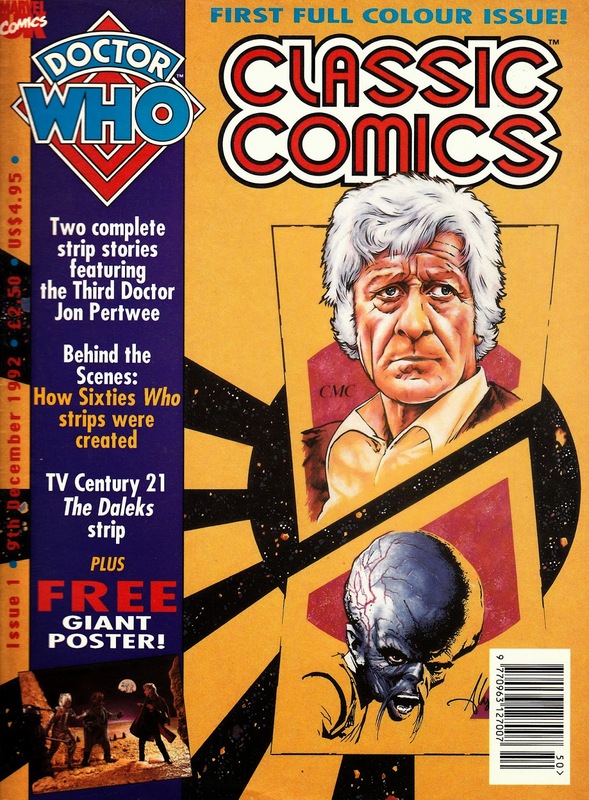 The genius (and, surprisingly, never repeated) behind this four-weekly was to take the extensive back catalog of WHO strips (Marvel's own along with everything from TV COMIC, COUNTDOWN, TV ACTION, TV CENTURY 21 and even the US one-shot adaptation of the first sixties Dalek movie) and reprint 'em. Marvel encountered retailer and distributor reluctance to carrying a new launch based on a fading TV show and packed full of out-of-time monochrome reprints so the British Bullpen had to colour material originally published in black & white. Long-time fans were (occasionally) agog but it was a compromise worth making just to get the vintage material back into the public domain. DWCC eventually clocked-up a 27-issue run and spun-off the EVENING EMPIRE one-shot (of which, only the first installment had ever seen print before... and even that was reworked for the collected edition). Several other contemporary Marvel WHO specials, most notable the done-in-one compilation of the TV21 DALEK strips, were DWCC specials in all-but-name. Every issue featured a brand new, specially commissioned cover and many featured text pages devoted to the history of the strips. 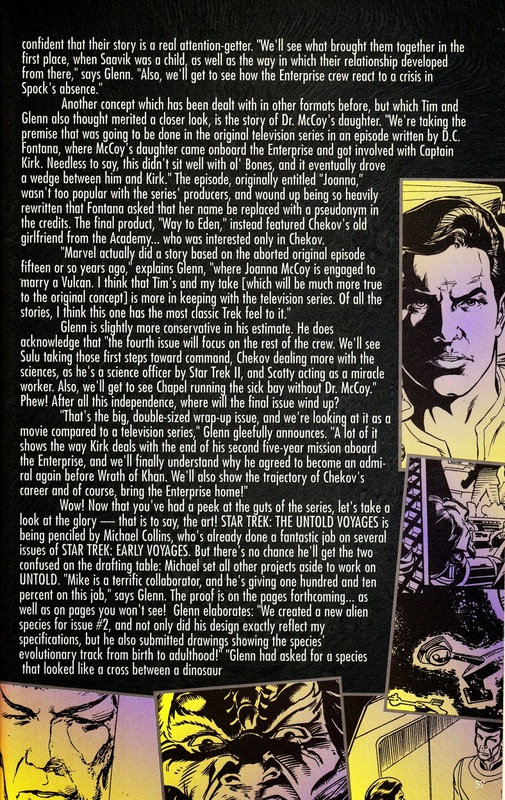 The Telesnaps feature, a mainstay of the regular magazine, also appeared in CC in an attempt to encourage readers to sample the spin-off. Panini apparently still hold the rights to all the material acquired for DWCC (as well as all the strips published during Marvel/ Panini's long stewardship of the license) but, surprisingly, have yet to do anything to exploit them. Personally, I still hope for a hardback partwork in the style of the two Marvel runs (red and black) and the upcoming (now confirmed for a national launch) JUDGE DREDD series. 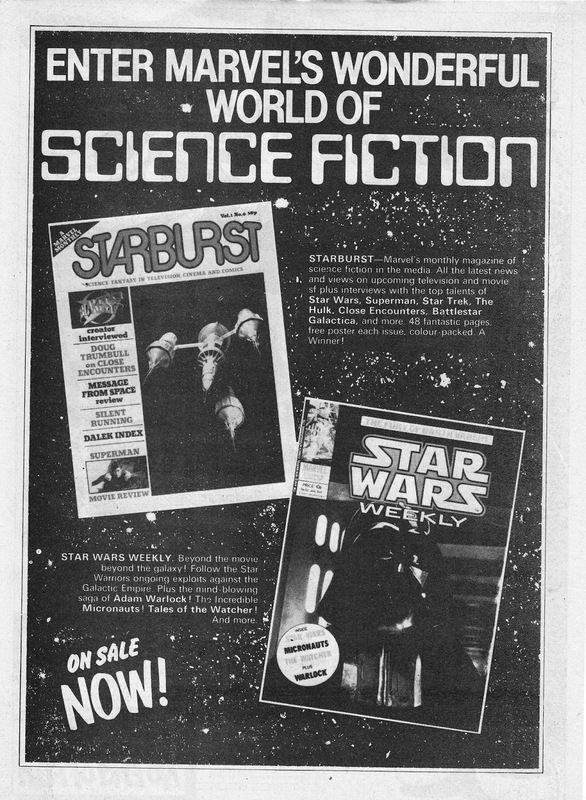 From January 1979: Four icons of the Star Age... STARBURST MAGAZINE, STAR WARS WEEKLY, BLAKE'S SEVEN and DARTH VADER. All courtesy of Marvel UK. What more could any Star Warrior want? 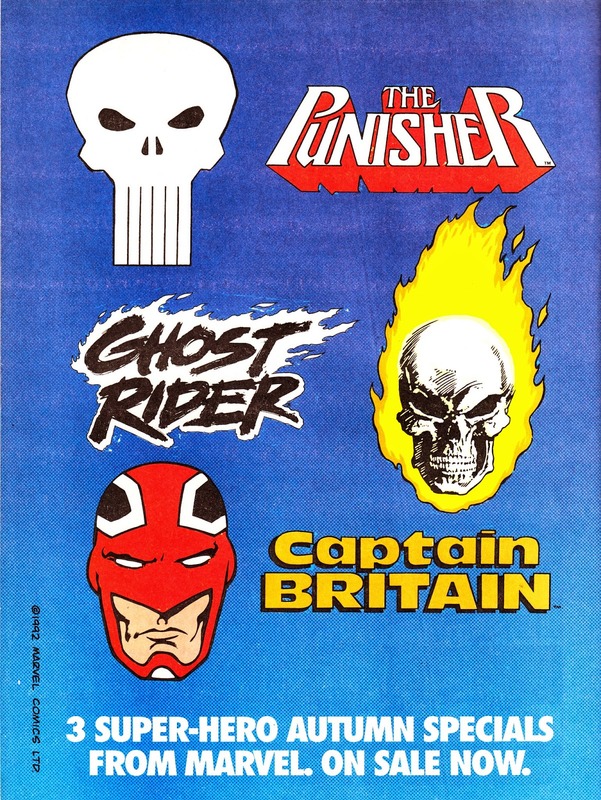 From late 1992: a strictly "that will do" MARVEL UK House Ad for three Autumn Specials: THE PUNISHER, CAPTAIN BRITAIN and GHOST RIDER. 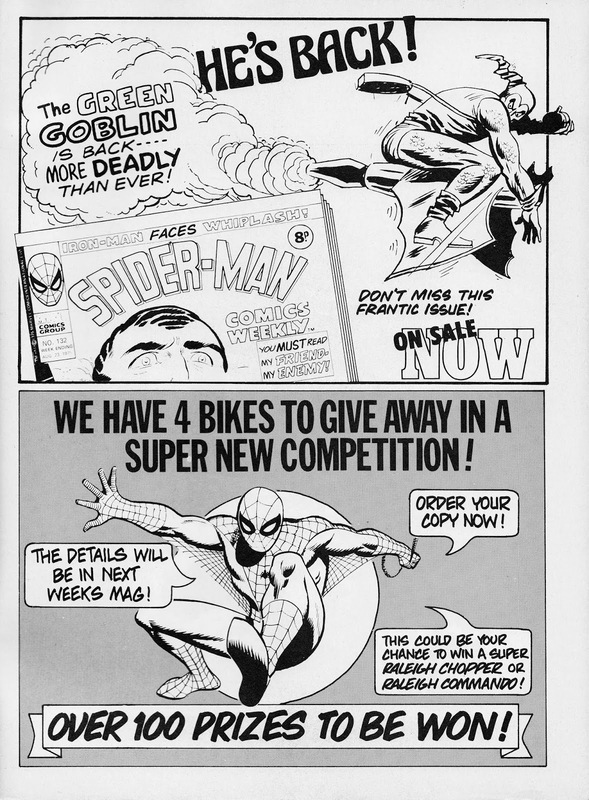 From August 1975: A MARVEL UK House Ad for SPIDER-MAN COMICS WEEKLY and a tease for the following week's issue with the chance to win iconic Seventies bikes Chopper and Commando. Yeah. 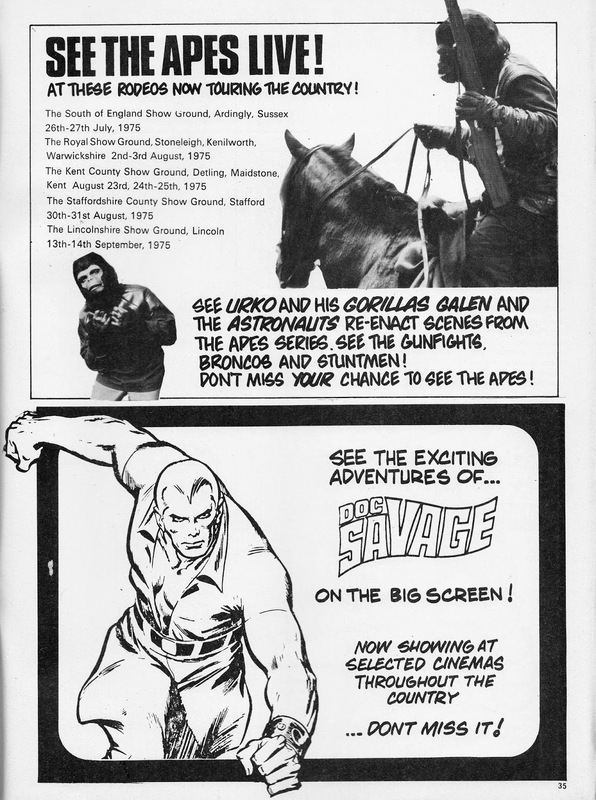 From the Summer of 1975: a not-to-be-missed chance to see the touring PLANET OF THE APES stunt show as it romped its way around various outdoor shows and summer events. I wonder if more people saw the live POTA show or the underrated DOC SAVAGE movie....? 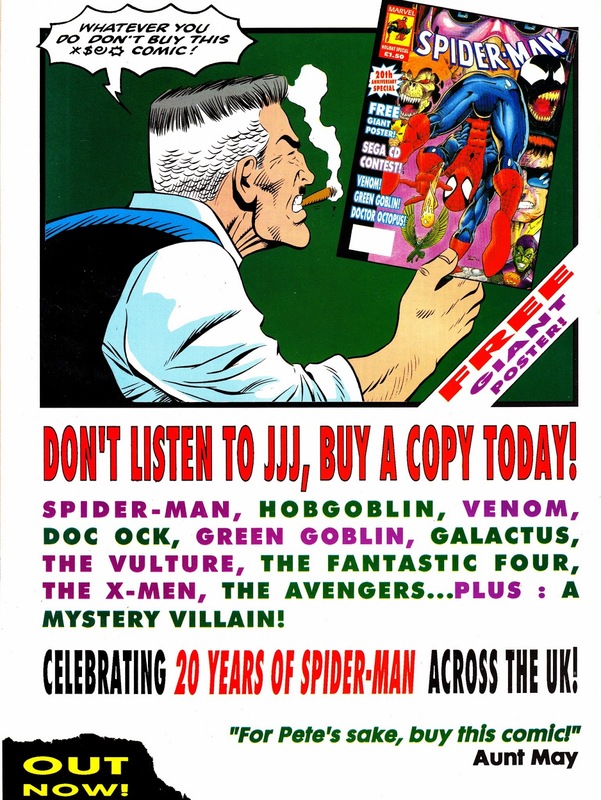 From the summer of 1993: a MARVEL UK House Ad for that year's SPIDER-MAN SUMMER SPECIAL, marking twenty years of the Spider-man comic in the UK (except for the "lost years" in the late eighties... but we won't mention that...). 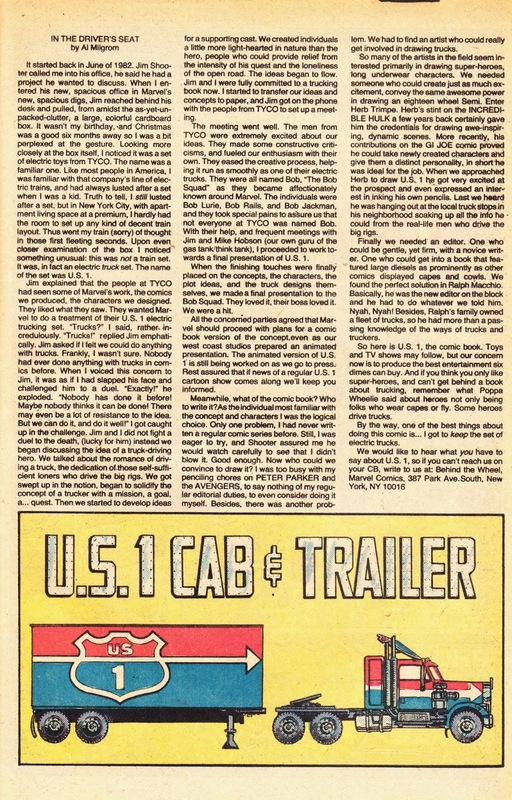 From 1983: Another Marvel licensed property that never crossed the Atlantic... the first issue (and background text piece) of the US 1 series, based on a line of toy trucks from Tyco. 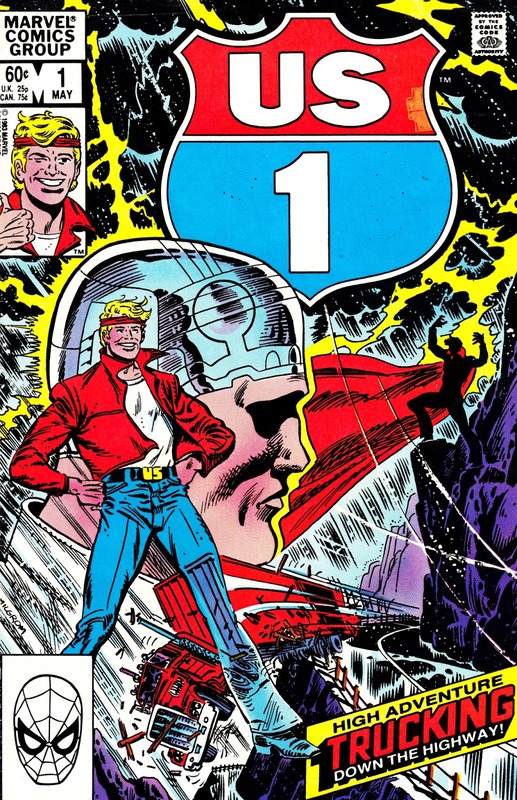 The comic ran for the standard twelve issues before Marvel declined to renew the license for another year, depriving the world of the further adventures of Ulysses Stone (U.S to his friends... genius) Archer. 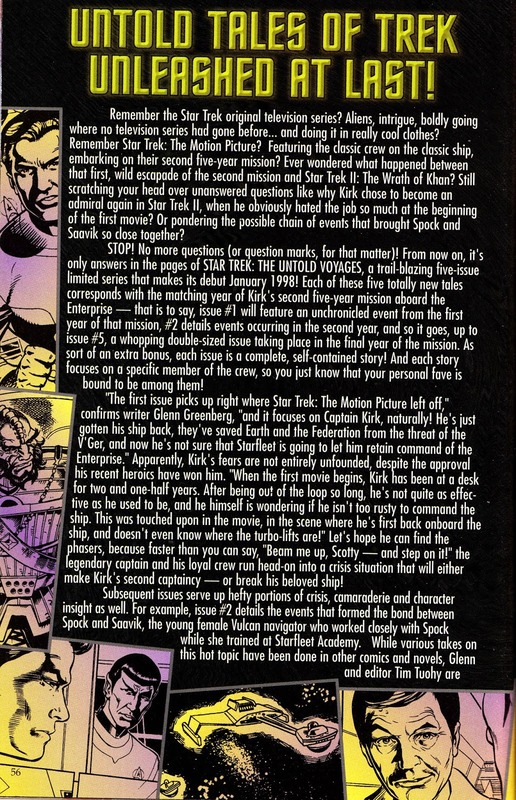 From late 1997: More coverage of Marvel's STAR TREK line from the pages of MARVEL VISION, the in-house fan-zine (and successor to MARVEL AGE MAGAZINE). 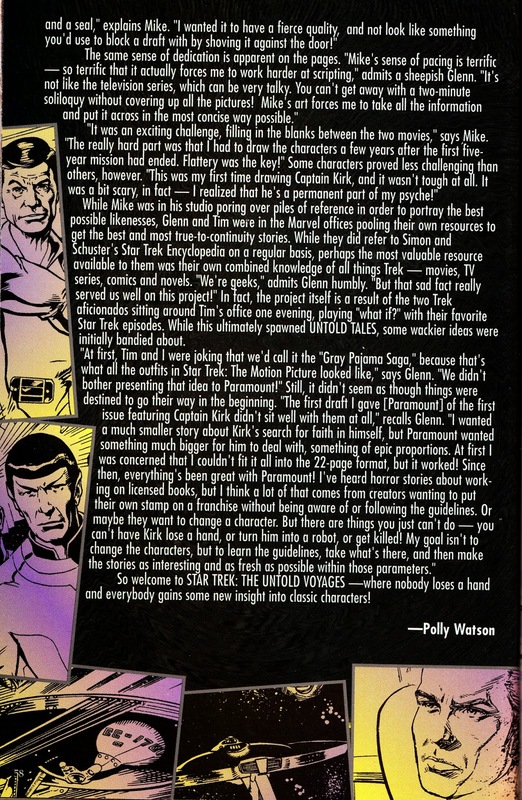 STAR TREK: UNTOLD VOYAGES (the "the" was jettisoned along the way) was a five-issue run of stories, featuring Kirk and crew, set after the events of STAR TREK: THE MOTION PICTURE. The movie series, after the flawed first outing, ignored the possibilities of post-V'Ger adventures and a second "Five Year Mission" (at least enough time for Star Fleet to hire someone to redesign their wardrobe again)... leaving the way wide open for fans and licensed books and comics to fill the gap (The DC TREK run featured a one-off Walter Koenig-scripted adventure from this period). 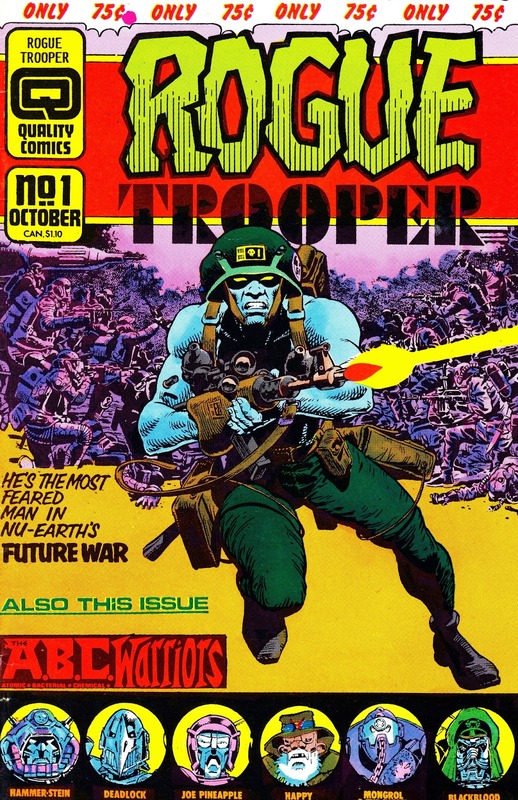 From 1986: The launch issue of Quality Comics' ongoing ROGUE TROOPER colour monthly. Featuring A.B.C Warriors (also from 2000AD) as the supporting feature. The ongoing title survived the trials and tribulations of the (not always) Quality operation to clock-up a respectable run of 49 issues. 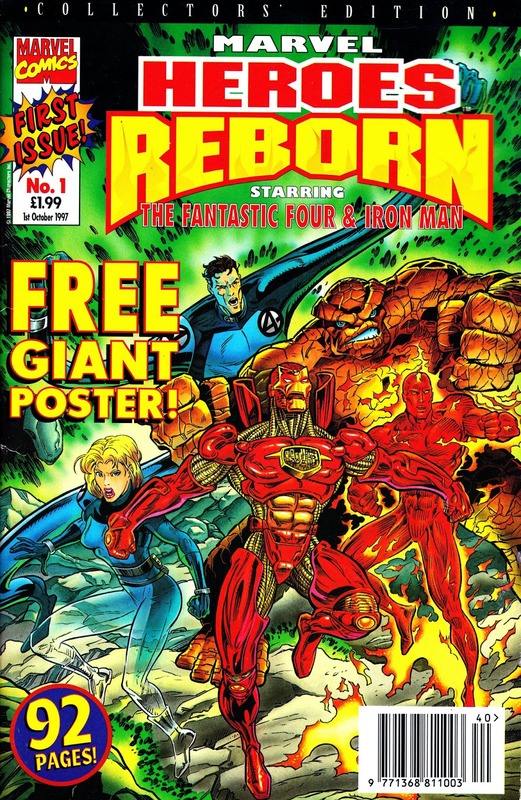 From 1997: the first issue of Panini UK's HEROES REBORN COLLECTORS' EDITION, the British reprints of the rebooted Fantastic Four and Iron Man strips. HEROES REBORN was a bizarre Marvel New York initiative that took control of some of their most bankable characters (the above plus The Avengers and Captain America) and outsourced all the creative work to Jim Lee and Rob Liefeld, two ex-Marvel creators who'd bailed years earlier as part of the mass exodus to create Image Comics. 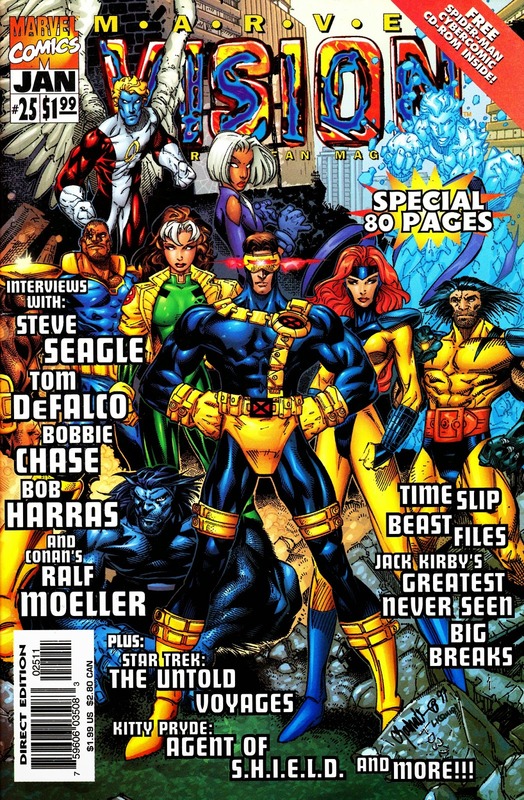 The year-long project was mired in controversy as the radical reboots didn't always find favor with fans, alienated the existing creative teams who were unceremoniously dumped to clear the decks for the newcomers and Marvel's beleaguered editorial teams who saw some of the company's crown jewels being handed over to outsiders, on lucrative contracts, who had spent (in some cases) the previous few years bad-mouthing the publisher who had helped make them industry stars in the first place. The experiment lasted a year (I believe Liefeld, never one of the industry's most reliable creators, was asked to exit earlier). 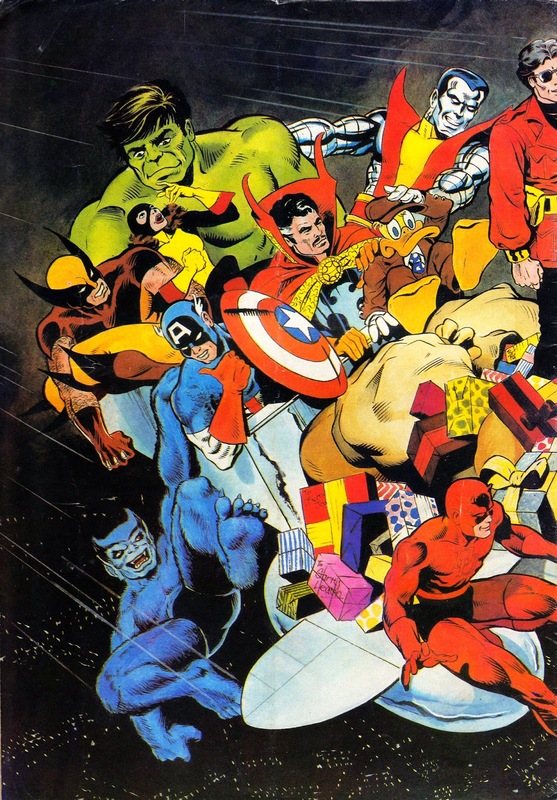 The characters then returned to the mainstream Marvel Universe in the Heroes Return event. The British edition managed a 42-issue run before shuttering. 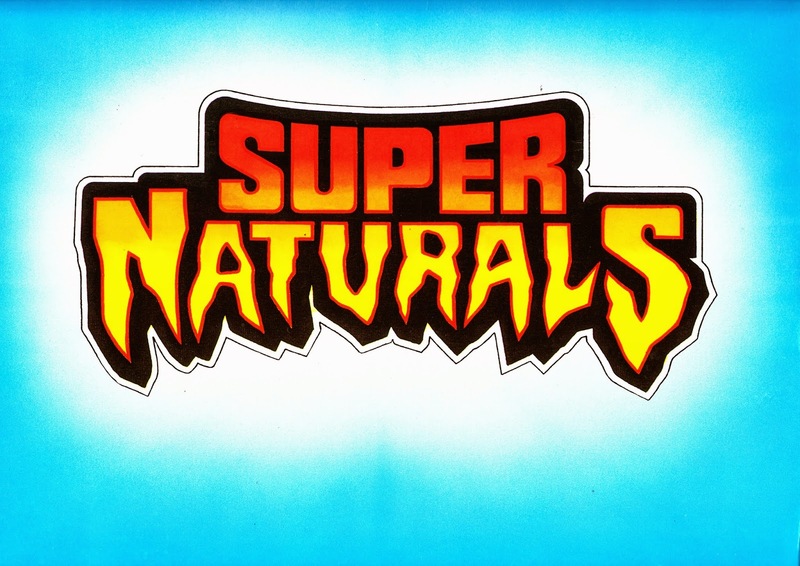 It shouldn't be confused with the impending 2015 revival of the HEROES TV series. 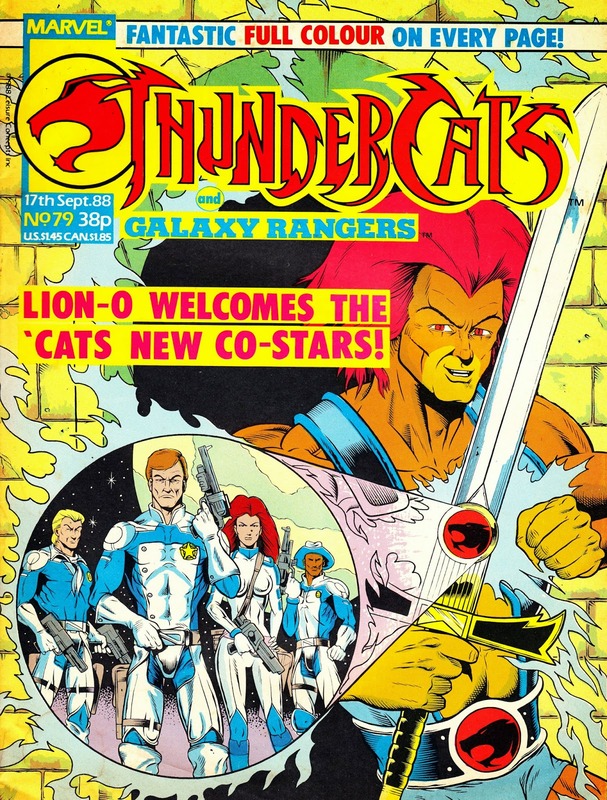 From September 1988: Two-become-one when MARVEL UK folds the short-lived THE ADVENTURES OF THE GALAXY RANGERS into the pages of the (considerably more successful) THUNDERCATS. The SF Western, based on the superior animated series, mustered only nine fortnightly issues before the axe fell. I suspect it was down to a combination of poor sales, the higher-than-average costs of origination (each issue featured a brand-new GR strip created by the British Bullpen) and the poor scheduling of the TV series itself (as I recall, ITV tucked it away in their summer holiday schedules... which ensured an episode five days a week... but in a time slot with few viewers). The Annex of Ideas obviously had a few weeks of inventory already on-file which they burnt-off in the new weekly, followed by several more reprints of the original strips initially commissioned for the GR ANNUAL, published around the same time. The Galaxy Rangers license was exclusive to Marvel UK and wasn't picked-up by the US operation. Whether these British strips were syndicated anywhere else is unknown. Both the THUNDERCATS and THE ADVENTURES OF THE GALAXY RANGERS have been released on DVD. From 1989: A MARVEL UK House Ad for their VISIONARIES SPRING SPECIAL, based on the short-lived Hasbro toys and obligatory animated series (which aired on the BBC here in the UK). 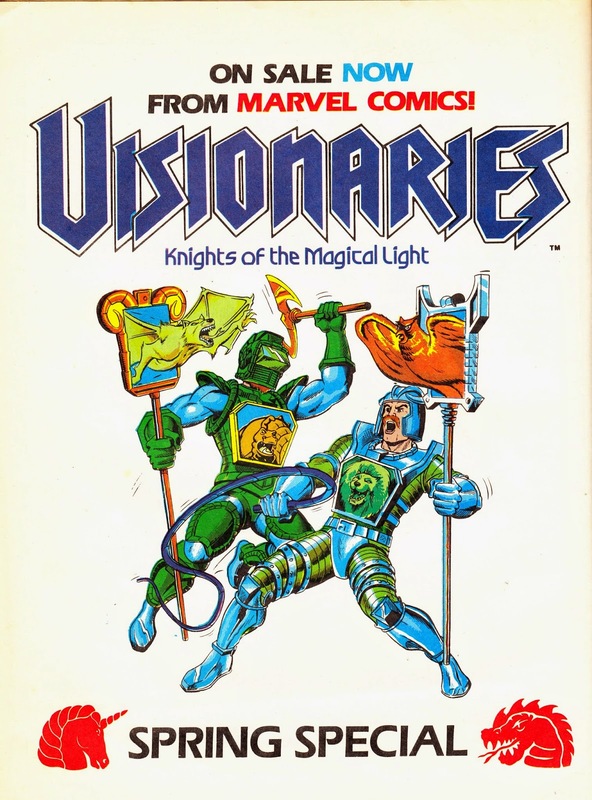 This was probably the Special that reprinted the identical contents (right down to the cover) from the fifth and final issue of the regular Visionaries monthly. The strip was also a recurring feature in THE TRANSFORMERS after the cancellation of the monthly. Presumably a toy company obligation as Hasbro, of course, also owned the Robots in Disguise. 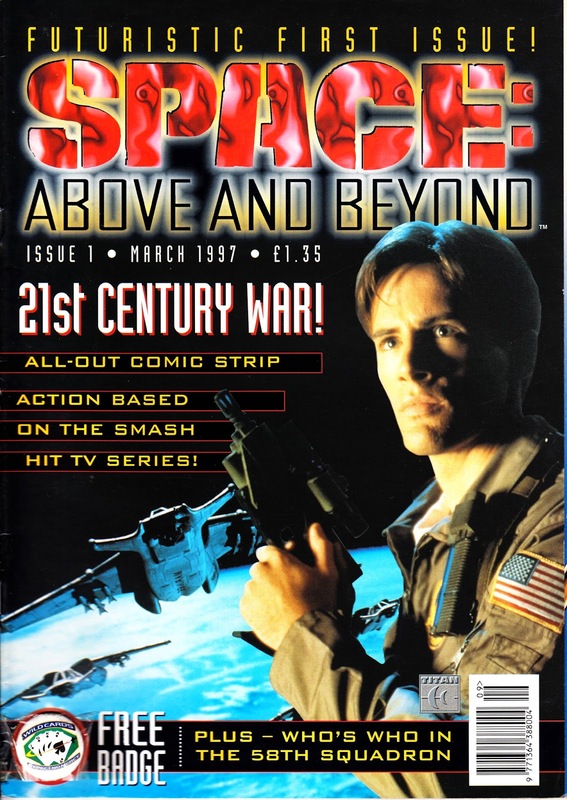 From March 1997: The first issue of Titan Magazine's SPACE: ABOVE AND BEYOND comic/ magazine, based on the short-lived FOX fighting-in-space TV show that spluttered to a halt after one season. Titan must have known this monthly had a finite life before they even published this first issue (complete with a nice pin badge with the squadron logo) as the bulk of the contents came from the US comic published by Topps... and that only mustered five issues before closing. The three-part limited series revived the old Marvel tradition of stretching an adaptation of the feature-length pilot over three issues. The two-part follow-up, The Gauntlet, was an original adventure. 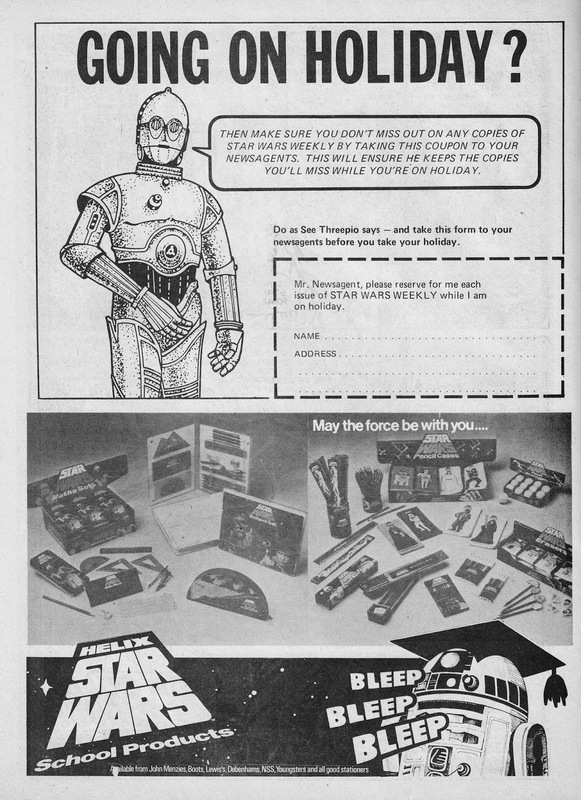 The end of the TV show, along with (presumably) low sales, meant Topps didn't publish anything else. The UK edition managed four issues (the three-part pilot and the first installment of the follow-up) with an announcement that the impending fifth edition would be the last. Titan obviously had no intention of spending their own money on commissioning new material. But the fifth issue never appeared. 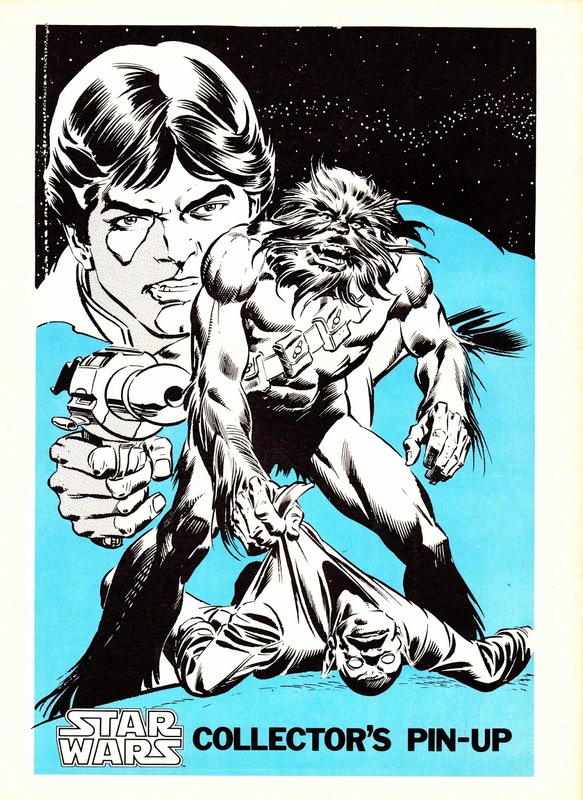 Titan also issued a trade paperback collection (now long out-of-print but a regular fixture of remaindered book shops for years) which collected all five of the US issues. The demise of the Titan edition can probably be attributed to the show's UK scheduling. Sky, predictably, had first bite and - as I recall - ran the show on (the soon-to-be-defunct) SKY TWO channel (which they seemed to be positioning as their home for SF and fantasy shows). Titan launched the monthly to coincide with the terrestrial broadcast on BBC TWO... except the schedulers tucked the show away in a late Friday night slot where audiences (especially the type who would then go out and buy a comic about the show) must have been miniscule. The show has now been released on DVD. 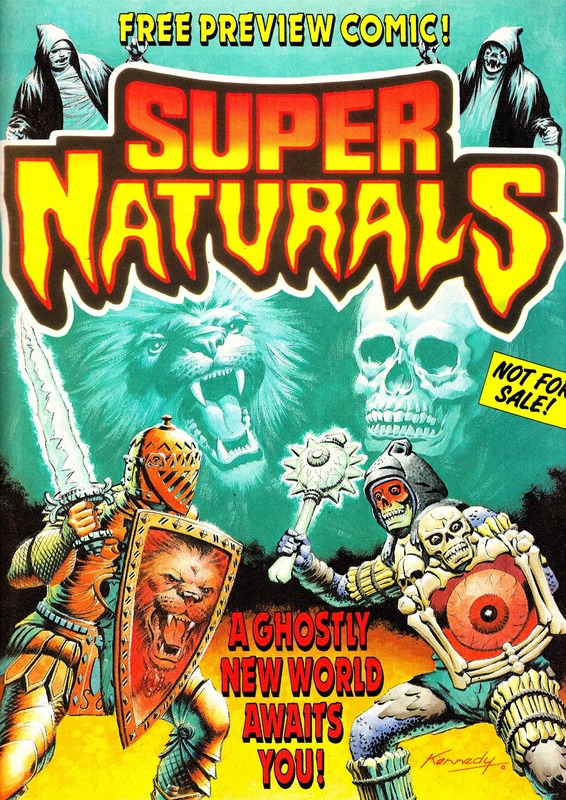 From October 1987: One of the forgotten toy/ comics combos of the decade: SUPERNATURALS. 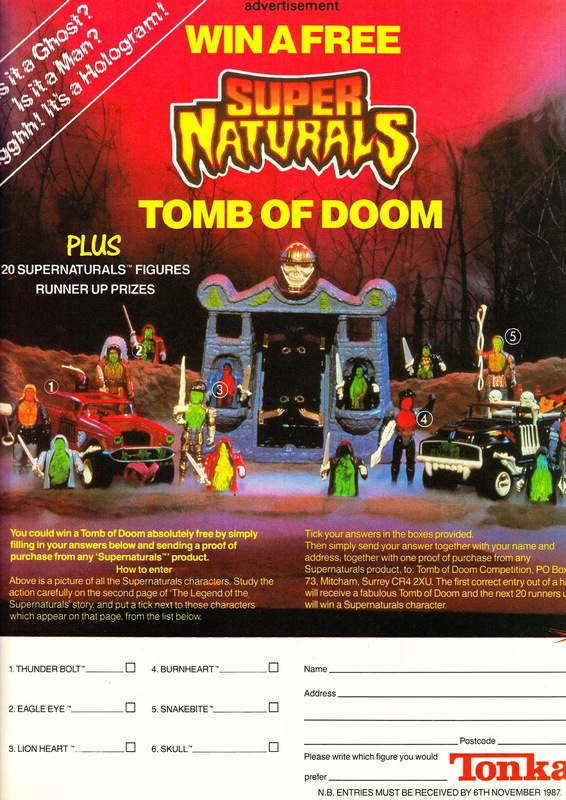 I never owned any of these action figures or vehicles myself but - if my memory serves - they used glow-in-the-dark technology as their USP. 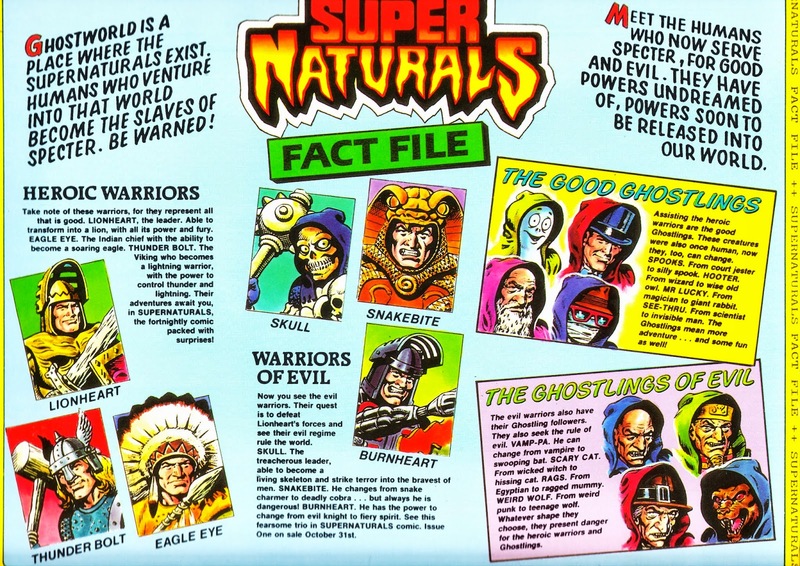 Tonka didn't have the wherewithal to launch an animated series (and, even if they did, the market was pretty crowded by this point) so formed a marketing partnership with Fleetway (nee IPC) in the UK to get the premise into a comic. Following the tried-and-tested M.A.S.K business model, Fleetway kickstarted interest in the new launch by giving away a preview edition with their other weeklies. This, of course, doubled as an ambitious plug for the toys themselves on the assumption that far more people would read the preview (and possibly buy the toys) than would actually start buying the new title. 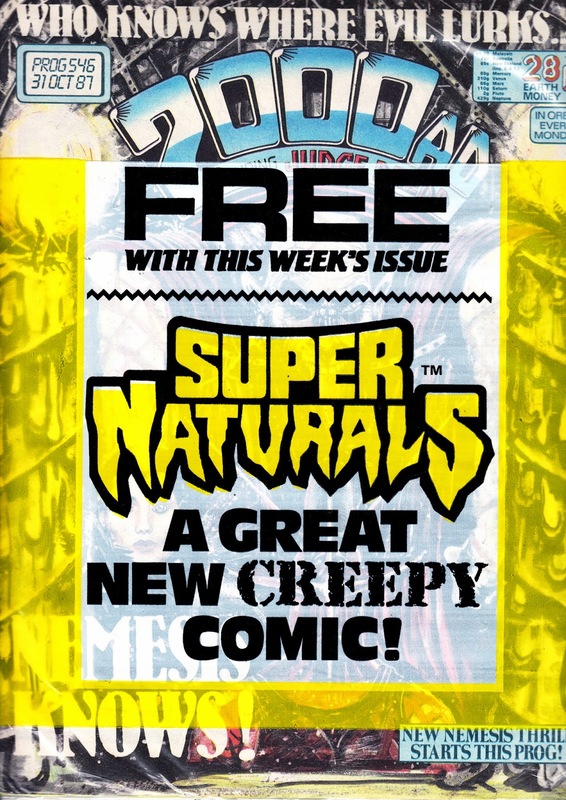 The preview was bagged free with 2000AD 546 and EAGLE 263. In addition to the one-shot, the polybag also included a double-sided card insert with a rundown of the various characters featured in the stories. The regular fortnightly comic lasted a mere nine issues before Fleetway pulled the plug. A Holiday Special (possibly published purely to meet any outstanding contractual obligations and to burn-up any existing commissioned inventory) and Adventure Book (reprints from the fortnightly) also appeared. The strips never reached it to the States (although they may have been syndicated to other territories) and it's unlikely any copies of the comic ever crossed the Atlantic either.